The item Made with love : the Meals on Wheels family cookbook, (ebook) represents a specific, individual, material embodiment of a distinct intellectual or artistic creation found in Charlotte Mecklenburg Library. Recipes and personal stories from dozens of celebrities including Martha Stewart, Suzanne Somers, Al Roker, and more! Celebrating the importance of family, Made With Love: The Meals On Wheels Family Cookbook includes recipes from the tables of well-known actors, chefs, writers, and other celebrities-along with personal stories about their favorite family meals. Learn to cook: - Patti LaBelle's Baja Fish Tacos - Cokie Roberts's Artichoke Gratin - Al Roker's New Orleans-Style Barbecued Shrimp - Judi Dench's Bread and Butter Pudding Other contributors include Helen Mirren, Martha Stewart, former First Lady Barbara Bush, Mario Batali, Nikki Haley, Paula Deen, Joan Lunden, Kurt Warner, Dr. Maya Angelou, Joan Rivers, Ina Garten, and many more. Providing more than a million meals a day for seniors across America, Meals On Wheels Association of America is the oldest and largest national organization of its kind. 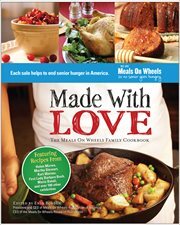 Each sale of Made With Love: The Meals On Wheels Family Cookbook helps to end senior hunger in America!